Three new pieces in the shop! 90 different listings to browse with more on the way— lots of different price points AND free shipping! Several more littles with very different looks are available now! 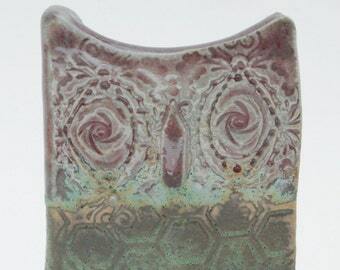 A few more functional/sculptural/whimsical/owlish items have been added to the shop! More salt & pepper shakers to be added in the near future— some of the roaring kind! I know I said be adding new pieces on a regular basis... the non-ceramic parts of my life take over sometimes. Anyway, here's a sculpture of best buds. I'm aiming to post new listings daily, a few at a time, until I run out of inventory! Salt & pepper shakers, sculpture and wall art that have been languishing... please keep checking in... I'm on a mission! I've been busy photographing lots of work and learning how to use my new kiln! I've had a successful first bisque firing, now I'm working on getting the inaugural glaze into motion. Stay tuned for more... soon! 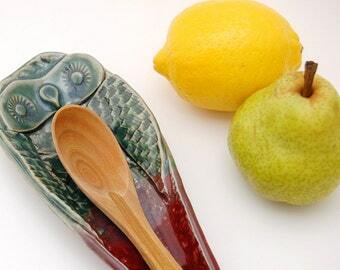 I have two spoon rests up in the shop along with a new little mixed media raku owl sculpture— he's a "second" so you can scoop him up at a deep discount! 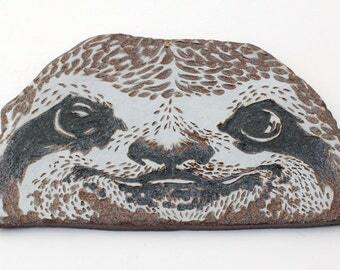 Getting back to listing new pieces— Ferdinand here is ready rest on your window sill or bookshelf! I'll be taking new photos of pieces, and ongoing as I work, that will be informational about either the process or the tools & textures used in the creation of! Four new items up for grabs in the shop! I'll try to add more as the weekend progresses. I have some cobalt blue porcelain beauties I've been meaning to list— those will be next. Finally reached 50 pieces available in my shop! I'm working on getting several more finished sgraffito tiles listed tonight and tomorrow. Comrades is one of my favorites in the lot! 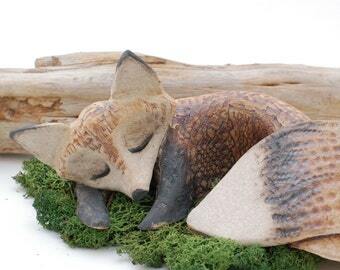 Folami Fox was listed & sold in a matter of minutes today, but you can still get your hands on Fern! I've also got a slightly larger sleeping fox sculpture awaiting their final cone 10 fire. Another week or so! Hang tight! A whole slew of seconds are up for grabs with more to come tomorrow! Merriweather has been listed! Photos of this gal were tough to capture... more new pieces are on their way! Red Fox Blue Owl Ceramic Figurine - Woodland Animal Duo Sculpture - Sleeping Fox Hand Built Statue - Fine Art Pottery "Companions"
Ceramic Owl Sculpture - Hand Built Primitive Stoneware Raptor - Bird Figurine - Home Office Decor Pottery - Fine Art Owl Totem "Banjora"
Ceramic Owl Sculpture - Hand Built Rustic Stoneware Raptor - Bird Figurine - Home and Office Decor Pottery - Fine Art Owl Totem "Nugget"
Ceramic Woodland Fox Sculpture - Red Sleeping Fox Figurine - Hand Built Fox Home Decor - Fine Art Rustic Animal Pottery - "Ferdinand"